Includes champagne toast & souvenir flight certificate! 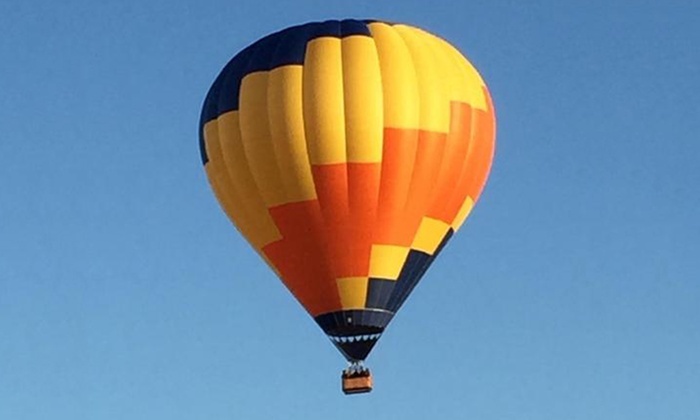 Vegas Hot Air Sin City Balloon Rides is an owner-operated, fully insured hot air balloon ride company providing scenic tours of the Las Vegas Valley! On your Las Vegas Sunrise Hot Air Balloon Flight you will rise high above the Las Vegas Valley for an experience of a lifetime! You’ll enjoy amazing views of all the incredible sights to behold along the Las Vegas Strip and be “blown away” by the beauty of the surrounding mountains and Red Rock Canyon. Your Las Vegas hot air balloon ride offers unmatchable photo and video taking opportunities – so bring your camera to capture all the memories to share with your friends and family. Your tour starts with a warm beverage and a treat before arriving at the launch site. Once there you’ll get to watch the crew prepare the hot air balloon for your flight. As you ascend into the sky over Las Vegas your pilot will point out all the wonderful sights, such as Red Rock Canyon, the surrounding mountain ranges, and of course the Las Vegas Strip. If you’re lucky you might even spot some desert wildlife, like our native Rocky Mountain Big Horn Sheep. After the balloon ride, passengers celebrate the experience with a sparkling toast and receive a photo flight certificate as a souvenir from the journey. The normal launch site is located near the IKEA store off of Durango and the 215 freeway. Balloon tours operate 7 days a week year-round (weather permitting). Hotel pick up/drop off is available from select hotels. Balloon flights are 45 minutes to an hour. Your total experience, from hotel pick up to drop off, takes approximately three to four hours. Cancellations or changes to your reservations can be made up to 48 hours prior to the scheduled flight time. Cancellations within 48 hours of flight time may carry penalties.